LPC LAHORE: Rizvi’s/Master Paints and Barry’s registered victories in the Spring Polo Cup 2018 matches played here at the Lahore Polo Club (LPC) ground on Thursday. The first match of the day saw Rizvi’s/Master Paints defeating Newage/Guard Group by 7-4½. 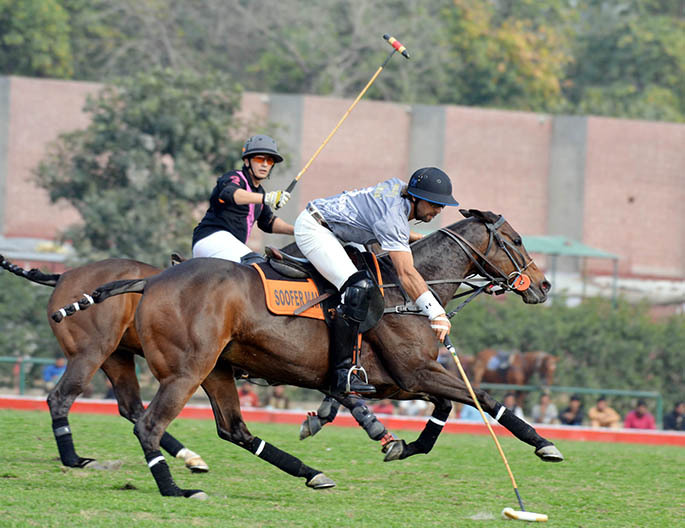 Juan Cruz Losada displayed outstanding polo skills by firing fabulous four goals while Hamza Mawaz Khan also played brilliantly by thwarting three tremendous goals in his team’s triumph. From the losing side, which had half goal handicap advantage, Salvador Ulloa hammered a hat-trick and Raja Arslan Najeeb contributed one. Salvador Ulloa scored the opening goal to provide Newage/Guard Group 1-0 lead in the first chukker. 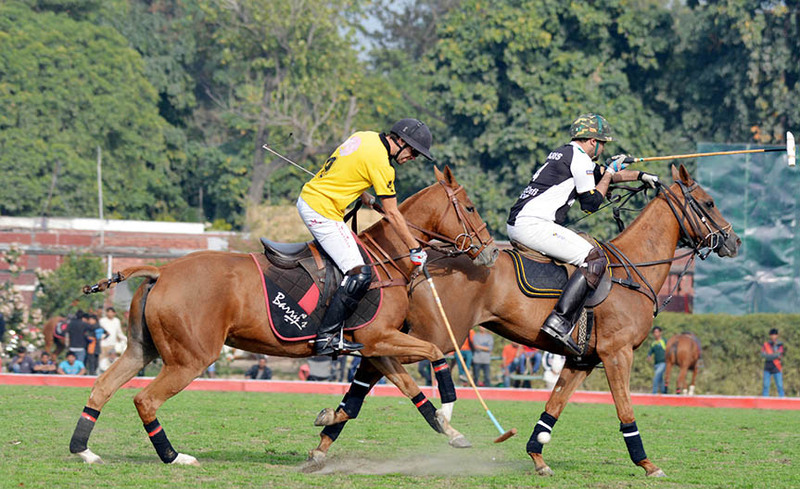 Hamza Mawaz then converted a 30-yard penalty to level the score 1-1 in the second chukker. In the high-voltage third chukker, total five goals were scored with Rizvi’s/Master Paints converting three – two by Hamza and one by Losada – and Newage/Guard Group slamming in two goals – one each by Salvador and Raja Arslan. The chukker ended with Rizvi’s having 4-3 lead. Losada excelled in the fourth and last chukker as he hammered an impressive hat-trick to give Rizvi’s 7-3 lead while in the dying moments of the chukker, Salvador hit one to reduce the margin to 7-4. With half goal handicap for Newage, Rizvi’s won the match 7-4½. Ignacio Negri and Miguel Luis Duggan supervised the match as field umpires while Masoc Araya acted as match referee. The second encounter of the day saw Barry’s outclassing Master Paints Black by 7½-1. Eight-goaler Tito Ruiz Guñazu slammed in a hat-trick for Barry’s, which had one and half goal handicap advantage, while Ahmed Bilal Riaz struck two and Raja Mikael Sami hit one. From the losing side, Saqib Khan Khakwani scored the only goal. The match started with Saqib converting an impressive goal off 30-yard penalty in the beginning of the first chukker to give Master Paints Black 1-0 lead. Barry’s then bounced back in style and struck a leveler through Tito Ruiz. After that, it were all Barry’s who dominated the remaining three chukkers as they thwarted three goals in the second chukker to make it 4-1, with Ahmed Bilal scoring a brace and Tito Ruiz hitting one. Tito Ruiz added one more in the third chukker to enhance the team’s lead to 5-1 and Raja Mikael contributed one to give Barry’s 6-1 edge. With one and half goal handicap advantage, the final score was 7½-1 in favour of Barry’s. Macos Araya and Bilal Haye were field umpires and Ignacio Negri was referee. Army Whites will take on Diamond Paints Black in the only match of the day to be played on Friday at 2:00 pm.